Looking at your horse's hooves can tell you a lot about what might be going on in the body. Important factors influencing how your horse's hooves grow include diet, exercise, environment, health, and your farrier. However, many overlook a very important variable that influences hoof growth: weight distribution. If you see asymmetrical hoof growth patterns, such as the two front feet growing differently (see photo at left) or the toes growing significantly faster than the heels, uneven weight distribution may be the cause. Weight distribution greatly influences hoof growth. When imbalances occur in the equine body, they will inevitably reveal themselves in the feet as asymmetrical hoof growth. Even a very subtle imbalance can be detected in this manner, where nothing obvious is detected in the stride/movement. The horse just might seem off a bit in its movement, nothing specific. In identifying whether your horse has a need for bodywork, the key is to look for symmetry. When asymmetry is present, you can usually count on a problem developing somewhere, either as a result of the asymmetry, or as a symptom of a deeper problem. Checking your horse's hoof angles is a fast and easy way to identify a problem. Typically, what will happen is the horse will, in an attempt to alleviate the pain in an affected limb, shift the weight to the opposite and/or diagonal limb. As a result, the affected limb, not bearing as much weight, will begin to display hoof growth at an abnormally upright or steep angle. Conversely, the weighted limb displays hoof growth that is more flared out. 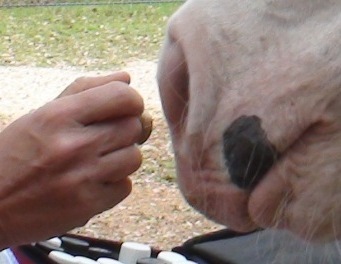 Another scenario occurs when the horse tries to rock the weight off the front feet due to pain in the front end somewhere, such as when a horse develops ringbone. In order to make itself more comfortable, the horse will weight the heels of the front feet in an attempt to rock its weight onto the hindquarters, driving the available blood flow of the hoof to the toes and causing the toes to grow at a faster rate than the heels. This creates a hoof with an abnormally long toe and short heel and causes excess strain on the flexor tendons of the front legs, as well as the pastern joint. In the case of the horse in the above photos, he had an injury to his left shoulder as a yearling. In an effort to relieve the pain and discomfort in the affected limb, he began shifting his weight over to the opposite side. The muscles involved in lifting the limb have become severely hypertensive and the left front hoof began displaying more upright growth, while the weighted hoof began to flare out in the years following the injury. This horse, although not completely lame, displays limited range of motion in the injured shoulder and a slight favoring of the limb during the weight bearing step. The original farrier, whom I worked with during the time the before and after photos were taken (the owner has since switched to a natural barefoot trim farrier), in an effort to correct the hoof angles had been trying to drop the heel down. However, because of the limited range of motion in the limb/shoulder, this would cause the horse to go very noticeably lame for a period of time following the trim, and of course because of the weight distribution, the heel continued to grow faster than the toe, creating a cycle of imbalance. I was brought in to work with the original farrier to help restore balance to this horse. I came in the same day as the farrier and performed a massage and stretches on the affected muscle groups to help them relax and stretch further than they had been able to on their own. After discussing the issues with the farrier, it was decided the best course of action would be to trim the heel in small increments and come back more often in order to help the horse's body adjust to the changes gradually. After this first visit, I followed up with the owner and she indicated that the horse did not go lame following the trim like he usually did and seemed much more comfortable. The farrier and I continued to work together as a team on this horse over a period of several months and by doing so have accomplished more together than we could have done on our own. Identifying these imbalances early is crucial to successfully treating the problem before a more serious problem and/or injury can occur. If you suspect your horse's abnormal hoof growth may be due to an imbalance in the body, consult with your equine healthcare team to help identify the problem and develop an appropriate treatment program. 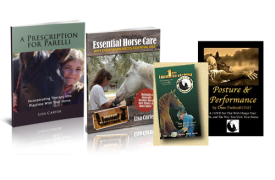 Good communication between your equine health care professionals (veterinarian, farrier, dentist, bodyworker) will assure the development of a treatment program that will provide your horse with the best chance of a successful return to balance. Over a period of about six months, with regular bi-monthly trimming and bodywork, this horse would no longer go lame after trimming, showed greatly increased range of motion in the affected limb, and according to the owner was much more comfortable overall. During this time, she also switched to Natural Hoof Care Practitioner, Gates Billette (NHCP), of Genuine Texas Hoofmanship, in Nocona, Texas, whom I worked in conjunction with on this horse for several more months. As evidenced in the most recent photos (below), while the front hooves still showed a slight imbalance, there was considerable improvement in the growth pattern overall as the horse had been able to more evenly distribute its weight. More work is still needed to be done, but he was well on the road to a more balanced body and feet. However, shortly after the photos below were taken, because the horse was showing such great improvement, the owner decided to forego massage therapy for a while due to financial constraints. After almost a year of no bodywork, he began to revert to his previous way of going and began to start favoring the limb again and his hoof angles started to go back to their previous asymmetrical growth pattern despite having no change in his regular trimming routine. She called me back in recently and after one session he immediately began moving more comfortably and she has vowed to see the therapy all the way through this time. I have encountered many critics that think the improvement in this horse was strictly due to a change in trimming. For those skeptics I will just say please take note that the horse had the same farrier during the time period that these photos were taken. The only change made to the trimming was the frequency of the trim, which reverted back to the old schedule after only a couple of months. It was only after the massage therapy was removed from the picture that the horse began showing signs of lameness and asymmetrical hoof growth again. Reintroduction of massage therapy (again with no change in trimming schedule or practitioner) showed an immediate and significant improvement in the horse's movement and comfort level, decrease in flaring of hoof on the right front and increase of flare and more natural angles on left front. Hi Boni! Everything is connected, and it’s very difficult to make positive changes without addressing all aspects of the underlying issue. Many people are under the impression that hoof growth patterns are directly related to the horse’s feet and trim rather than anything else that might be going on in its body. Adding bodywork to your routine can greatly improve your chances of improving the condition and making Buddy more comfortable. could you describe how you would manage a 2 year old that this year has developed an uneven back hoof, bearing more weight and walking on the outside of her back right hoof? She is barefoot and trimmed regularly, she has been noticely uneven on this 1 hoof for only 4 months so she has been trimmed more often since May. Now my farrier has recommended a support shoe to help place her weight evenly? I had an equine massage client that had the exact same thing, inside hoof wall was consistently longer than the outside wall (consistent with weight bearing to the outside of the hoof). He had a tendancy to track inside on that leg and had a strong pelvic imbalance that if he did not have regular bodywork to help keep him supple would cause the uneven hoof growth pattern. It was also important that the hoof professional kept him even or it remained cyclic. If the hoof wasn’t rebalanced, the bodywork didn’t help and vice-versa. I recommend that you have a bodyworker check your horse for imbalances, in particular check the soft tissue of the inner leg/thigh for hypertension. 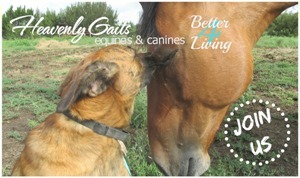 Your filly may have done something in the pasture without you noticing it. 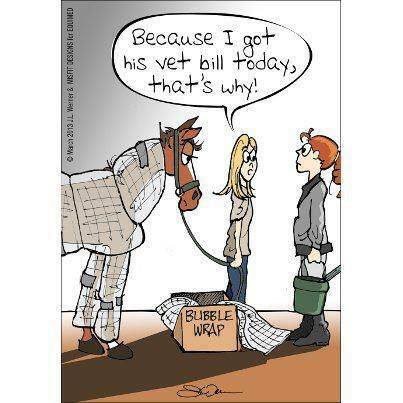 My horses do that ALL time time! Something apparently minor can take a while to express itself in the hoof growth pattern, but it usually ends up being the result of soft tissue contraction. As long as your vet has cleared her with no acute issues, you can add lateral ground exercises, like step outs and massage of the inner leg followed by abduction stretches (to the outside) to help the hypertension on the inner leg which may be contributing to this wear pattern. A reputable bodyworker can help show you how to do this.